Summer is coming to a close here in Colorado Springs much to the dismay or delight—depending on who you talk to—of the general public. It’s time to start embracing cooler mornings, wearing a light jacket, sipping a pumpkin spice latte, and getting ready for all the fall festivities that arise with the changing of the leaves. The end of summer and beginning of fall is often the best time for home maintenance to be performed that will prepare your residence for the impending winter months. 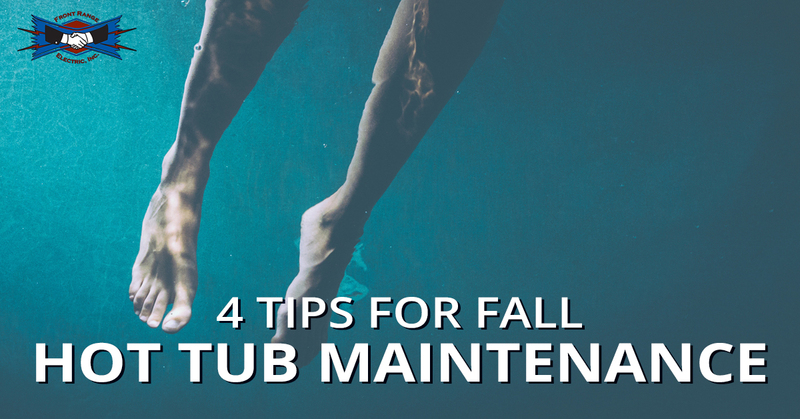 Today, we are going to talk about one of those maintenance items to prioritize during fall: hot tub maintenance. Thankfully, even though many summer swimming pools are closing, the time to enjoy your hot tub is still in full swing with the coming of cooler weather. To prepare for more cool fall nights of enjoying the company of loved ones and friends and the warmth of your hot tub, you should drain and refill your hot tub with fresh water. Typically, a hot tub should be drained every three to four months and refilled with new fresh water. Not only will refilling your hot tub with fresh water prolong the life of your hot tub, but it is in the best interest of the health of those that frequent your tub as well. Changing your filter is just as important as refilling your hot tub with fresh water, as a dirty filter can make even a new tub of water gross and unsanitary. It is always suggested that when you change your water, to clean your filter and replace them every year or every six months if you use your hot tub more often. Consider investing in a higher-quality filter if your water source tends to have a high mineral content. Taking the time to protect your spa cover will not only save you money, but it will help your tub’s cover do exactly what it was meant to do—effectively cover and protect your hot tub. To keep your space cover looking it’s best, you should clean it and treat it with the proper protectant. A non-abrasive cleaner is suggested. It is always best to inspect your cover now, before the heavy rains come, for if there are any holes or tears in your cover, you risk having a waterlogged and potentially ruined cover. It’s easy to forget about your spa cabinet until you are climbing in, swimsuit-clad and ready to relax. Just as the water should be changed every three to four months, so should the spa cabinet be cleaned and treated. A wood cabinet should be treated with linseed oil or staining treatments and a composite tub can be treated with the same treatment, however it is advised that you use a non-abrasive cleaner and oil-free protectant to best care for your cabinet. Taking care of your hot tub is a must to get the most enjoyment out of it not only during the present, but in the years to come. If you feel that you’ve performed all needed maintenance and your hot tub still isn’t working well, there may be an issue with it’s connection or the hot tub’s wiring system. The electricians of Front Range Electric in Colorado Springs would love to help you not only make sure that your hot tub is in working order with a period maintenance visit, but also to address any electrical problems you may have. Bought a New Hot Tub? Just bought a new hot tub? We can help you get it connected and all ready for you and your family to enjoy this coming fall season. Have a wonderful and festive fall season and remember to call the electricians of Front Range Electric for all your electrical needs!